Thank you! 3,771 of you helped make “Out of the Woods” a reality. We’ll now get busy creating a beautifully twisted tabletop card game, illustrated book, coloring book, and collection of art prints (among other things). Want to learn more? Check out the campaign page on Kickstarter. Keep up to date via my blog’s OOTW Project Page. And find OOTW products (as they become available) at Mysterious. American here with a special message to Alice fans: I know we’ve been spamming you hard with notifications about my new project, “Out of the Woods.” But with only 10 days remaining in the campaign, I really need YOUR support. Why? First, because I need the freedom to make NEW things unrelated to Alice and not controlled by EA. New projects allow me to remain independent, to run my own small studio, and to hire other creatives to output art, animation, music, and design. We can use that output for new projects, but also to revive the Alice franchise. I can’t do that if I’m working for someone else. I can only do that if I’m working for YOU. Second, because if another Alice is going to happen it’ll likely be through some form of crowd-funded development. If I can show EA the fans will get behind a crowd funding campaign in a big way, I can make the case that a new Alice game could be funded in that way. Trust me, they are paying attention to this new campaign and its outcome is CRITICAL to Alice’s future. My future and the future of Alice is in YOUR HANDS. If just 1% of the people who follow the Alice: Madness Returns page supported “Out of the Woods” at the lowest tier level ($35) the campaign would fund instantly. I could get to work on new projects and on building a campaign to take Alice on another trip down the rabbit hole! Don’t just sit there thinking “other people” will read this and lend their support. YOU are the key. YOUR action will make the difference. If “other people” haven’t lent their support yet, that means they are reading this thinking the same thing, “someone else will make it happen.” That someone else is YOU! Please, fans of Alice, supporters of my work, back the Out of the Woods Kickstarter today. Right now. Because my future and the future of Alice depend on YOU. Thanks. During the stream we’ll discuss the “Out of the Woods” Kickstarter which is at 75% backing with 16 days remaining. Myself, Martin, and Lulu will play the card game, discuss the illustrated book, and talk about all the unique add-ons and stretch goals we have available. You’ll be able to interact with us, ask questions, and provide feedback in real-time. 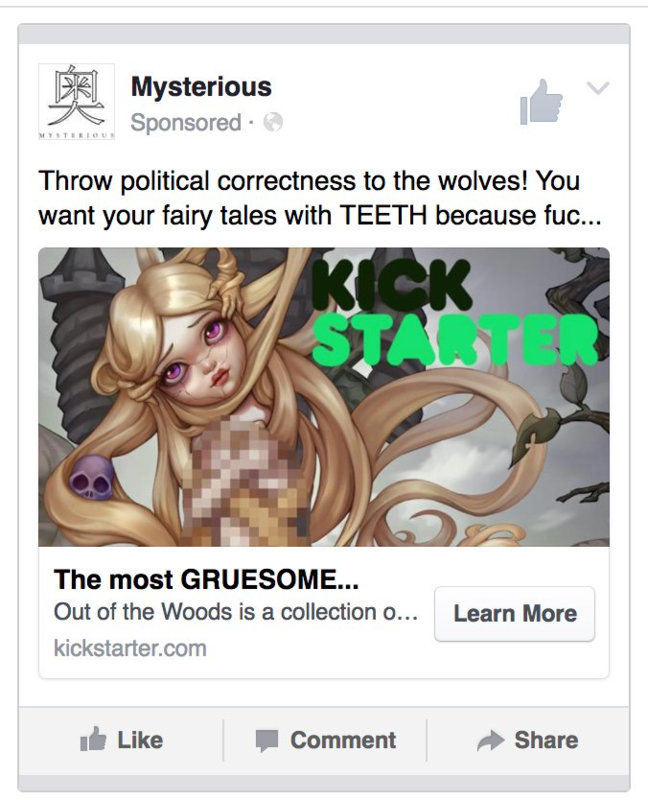 With my latest Kickstarter for “Out of the Woods” I’ve had to invest significant time, creativity, and money into a large-scale Facebook ad campaign. Kickstarter campaigns live and die by their ability to attract eyeballs. We began pre-campaign marketing on Facebook, Twitter, YouTube, and Instagram nearly two months before the Kickstarter launch. We grew the “Out of the Woods” Facebook page audience from 0 to 16,000 in that time, doubling our mailing list audience, and growing our other social channels similarly. Facebook has accepted these advertisements and happily taken their fee for impressions and click-throughs. In the background, their advertising platform analyses ad performance and automatically promotes image/text/audience combinations which perform best. Well-performing ads are good for everyone in the advertising equation – Facebook likes ads which engage and excite people while delivering a high CTR; advertisers like ads which maintain a high CTR and low CPI; while audiences like advertising which appeals to their interests and gives them an entertaining impression. Game industry media have picked up on this story and found it similarly amusing. But there’s also a sad statement made when a platform like Facebook embraces violence and gore while rejecting the human form and any hint of sexuality. People often try to blame video game content for (mis)-shaping the minds of adolescents – but what of the near-constant barrage of messaging (or messaging by omission) presented in advertising? I think Facebook has a fine system in place for automatically giving advertisers and audiences what they want. That system should be allowed to determine what works and what appeals. It’s not Facebook’s place to nanny us and filter the content we consume – any more than it’s their place to filter the news we read. Build a platform which caters to what people want to consume – and let the people decide! Do you want to send a message to Facebook and tell them you’ll decide what sort of content you consume? Consider backing “Out of the Woods” and show your support for independent creativity and artistic expression of the human condition. My latest twisted fairy tale project is live on Kickstarter RIGHT NOW. “Out of the Woods” is a collection of 10 fairy tales presented as a table top card game, illustrated book, coloring book, and selection of art prints. In 5 days we’ve already pulled in more than 50% of our funding goal, but we need YOUR help to maintain momentum and get to a strong finish. Please help, because if you don’t wolves will eat us all!